We have started a pdf archive of books and Journals that give an insight into the Association in its earlier days. To start the archive off we have a copy of the "Inauguration of the Cabane Britannia, 1912. One of our members, James Bogle, has written up the history of the Association and this was published in 2005. There are also Journals from 1975 to 2013. Please let Mike Goodyer know if you change your address or e mail to ensure that you still receive Newsletters. Royal Oak, Hurdlow, Derbyshire, May Day Weekend, 3-5 May. There are 14 places reserved in the Bunkbarn, contact Meet Leader to book on this popular meet. On the Glenfinnan Meet in May we are based in the converted railway sleeping car, for which we have sole use, at Glenfinnan Station Museum. Summer Hotel Alpine Meet will be in Klosters in July. Thirty nine members and guests have booked on to this meet. It is now full. Summer Alpine Camping Meet will be in the Pyrenees from 6 -27 July. There is a light hearted gallery of photos of members using their new buffs around the world. Photos from the recent new members meet are now posted - can you identify everybody? If you have any photos please send them to the Editor. The report of the Pitlochry Meet now available. The George Starkey Hut Maintenance Meet is now booked for August 16 - 18, just before the ABM/AC summer meet at the Hut. Contact Marian Parsons to book a bed. At the February 2019 AGM the committee proposed the introduction of a Development and Training package to encourage those who wish to develop their skills. The aim is to increase skills, promote the ABMSAC and increase membership. Details of the package have been finalised by Paul Stock and the committee and are in the financial assistance process document. The Annual Dinner was held at the Inn on the Lake at Glenridding over the weekend 1-3 Febraury. Snow fell on the Tuesday before and we were rewarded with fine clear days, but with patches of deep soft snow. The weather broke on the Sunday. Many members took advantage of the good weather and arrived earlier in the week. The hut was almost full! 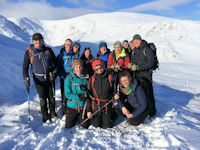 On the Sunday morning of the Annual Dinner weekend a group of us met at the Patterdale Mountain Rescue Centre and handed over a donation cheque for �450. The Mountain Rescue Team had already decided to buy a specialist new lightweight 'Cas Bag'. The 'Cas Bag' will be used on rescues during the Spring and summer months. At the AGM on Saturday 2 February Andy Burton was elected Treasurer and Paul Stock was elected Meet Secretary. This election has meant that James is able to stand down as Treasurer after 16 years to concentrate on his role as President and Andy has now passed on the Meet Secreatary role after six years. A big thank you to both James and Andy. We welcome Paul to the Committee. Over the weekend 7-9 June there is an Alpine skills Meet, based at the George Starkey Hut. This is an AC skills meet open to ABMSAC members. The focus will be on transferring techniques to members who wish to improve their alpine skills or in need of a refresher after a break from alpine climbing. The cost is �30 for the weekend which covers the cost of accommodation and a communal meal on Saturday night. Cicerone Press, the UK's leading outdoor activity guidebook publisher, will be 50 years old in March. They are planning celebrations through the year, and have already begun with the publication of a commemorative book, Fifty Years of Adventure, adding to their range of around 400 titles. The book has a range of over 50 interesting articles from guidebook writers accompanied with great photos. Srathpeffer Meet report and photos now available. A reminder: We have been invited to join in on the series of lectures organised by AC/SMC/JMCS in Edinburgh and Hathersage, Derbyshire by the AC this autumn/winter. Hopefully members who live in the area will be able to make use of this new venture. The History of the Association written by James Bogle and published in 2005 is now available as a pdf. A brief update on the Britannia Hut from the July edition of the Geneva Section monthly Bulletin. Many thanks to Pamela Harris-Andrews for the update. The hut is in Patterdale near Ullswater, at the heart of the Lake District�s Eastern Fells. It is ideally placed for the High Street range to the East, whilst from the front there is a splendid view of Helvellyn and its neighbouring fells: to reach them, all you have to do is put on your boots and walk from the hut. There are rock climbing and mountain biking opportunities from the front door, canoeing and sailing on Ullswater and pony trekking locally. Since mid 2016 we have had a new hut partner, the Alpine Club. The hut is run on behalf of both clubs by a limited company, George Starkey Hut Limited. The Chair is Mike Parsons and Marian Parsons is the Hut warden. The hut has a Members Room with eight beds and a further 20 beds that are bookable by clubs and groups. Members can now book directly through the Hut website. Before booking for the first time please register on the system. Increase in hut fees for 2019. After the AGM of the George Starkey Hut the Directors agreed that from 1 January 2019 the rates will go up for members from �6 to �7 per night and for non-members/guests from �11 to �13. For any questions about registering or booking please email the Hut Booking Secretaries on george.starkey.hut@gmail.com. At the February 2019 AGM the committee proposed the introduction of a Development and Training package to encourage those who wish to develop their skills. The aim is to increase skills, promote the ABMSAC and increase membership. Details of the package have been finalised by Paul Stock and the committee and are in the financial assistance process document. Heather Eddowes, Vice President, will coordinate the scheme. Download a copy of the Application Form for financail support. Please take time to read the policy and make sure that you give your permission to show all or some of your details in the Journal and to send you electonic news updates. ABMSAC Child Protection Policy and consent form. The web site for the Swiss Alpine Club has links into pages for the separate Sections.